Senior living communities are beginning to serve the most informed and demanding generation yet: the Baby Boomers. Some are children of residents, others have already moved in–all expect high standards of care and service. It’s no secret their expectations have fueled an industry-wide transformation. Order Today and Save 10% and get the digital .pdf version for FREE! 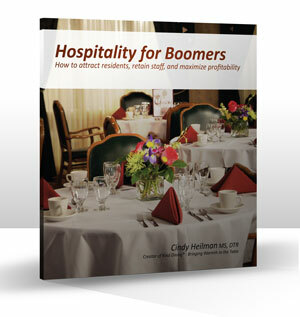 Order copies for your staff today and save 10% off regular pricing when you use coupon code: BOOMERS. Need many copies? Call for volume discount pricing. Cindy Heilman has over 30 years of experience in enhancing hospitality and food service quality. She is the CEO of Higher Standards, LLC, and is a dietetic technician registered with the Academy of Nutrition and Dietetics. She’s been a restaurant owner, health care food service director, health care specialist with a broad line distributor, board member of the Oregon Health Care Association, and holds a Masters in Nutrition and Food Management. Her research focused on service priorities of residents and staff, which led her to create Kind Dining® Training, a unique program that improves the dining experience in senior living communities. She serves on the education committee for Oregon’s culture change coalition called Making Oregon Vital for Elders (M.O.V.E.). She has been recognized as Oregon’s Dietetic Technician of the Year and she received the American Dietetic Association (ADA) National Award for Excellence in Dietetic Technology. She currently serves as ADA’s (now named the Academy of Nutrition and Dietetics) At Large Delegate: Dietetic Technician. Based in Portland, Oregon, Cindy speaks, trains and consults nationally on mealtime hospitality and raising service standards in nursing homes, continuing care communities, assisted living, independent senior living communities.